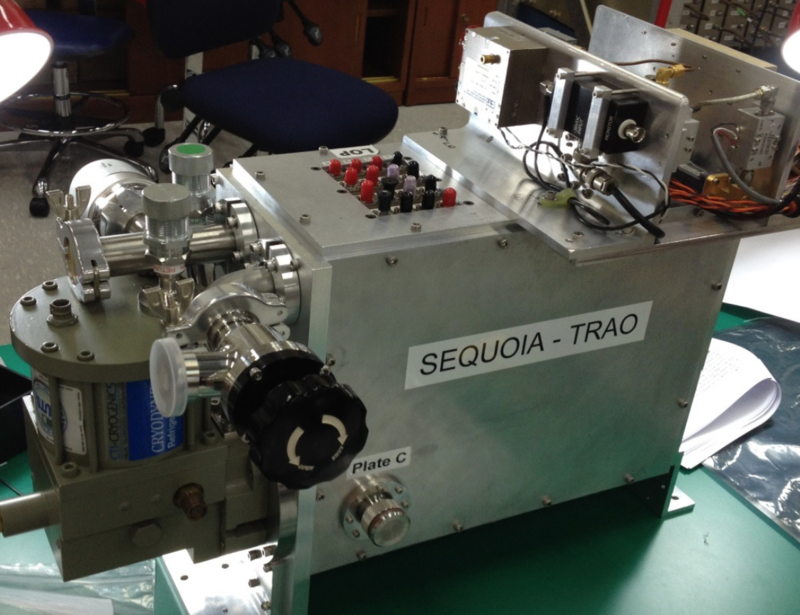 SEQUOIA-TRAO is a cryogenic focal plane array designed for the 85-115.6 GHz range. 16 pixels are arranged in a 4x4 array. The system uses InP MMIC (Monolithic Microwave Integrated Circuit) preamplifiers with 35-40dB gain. The noise temperature ranges from 50-80K over most of the band. No mechanical or electrical tuning is used. In each pixel, the preamplifier is followed by a subharmonic mixer with an IF band from 5-20 GHz. 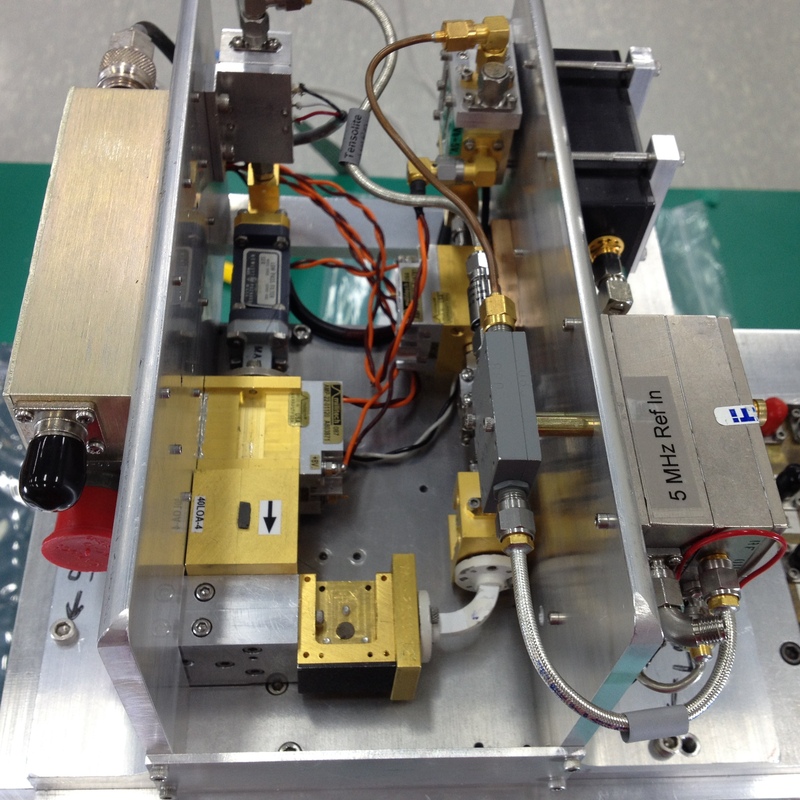 The entire signal band is covered with SSB(single sideband) response using just two LO's, at 40 GHz and 60 GHz. SEQUOIA is intended as a relatively low cost system. Each pixel uses simple machining and low-cost components. The second set of 16 pixels in the opposite polarization has been installed, using a wire grid for combination. The complete 32-pixel array has been used on the 14m FCRAO telescope. The receiver is designed for remote use, and all functions may be accessed from anywhere in the world. LO provided by a 10.05 GHz DRO source which is multiplied and subsequently amplified to produce	the 40.2 and 60.3 GHz frequencies. LO distribution is one of the most difficult problems with array receivers. 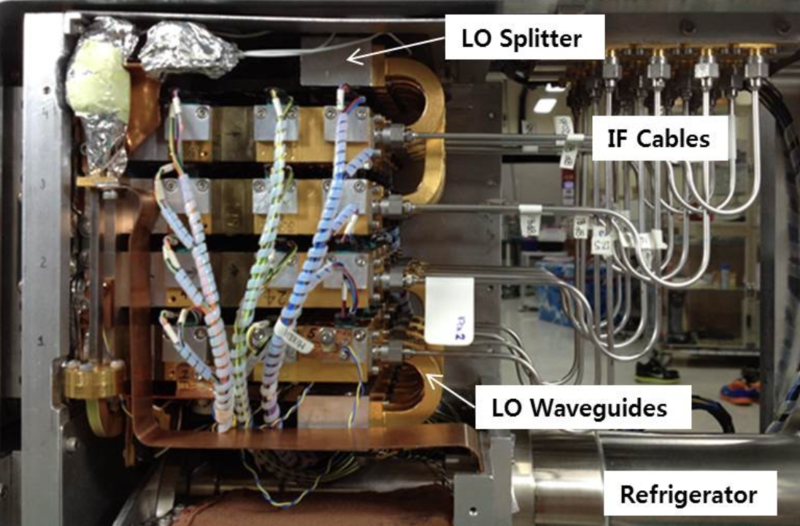 LO is split 16 ways using magic-T waveguide splitters. Junctions are tuned for only 40GHz and 60 GHz. Square feed horns are used, each with a 25 mm aperture. Each horn has one pair of corrugated walls (the other pair smooth), which creates patterns that are symmetric with low side-lobes. The aperture	field is. Each horn is in two pieces with a 0.1 mm gap. The aperture end of the horn is at room temperature and the waveguide end is at 20 K. The sections are aligned with thermal insulators that greatly reduce the conducted and radiated heat loads. 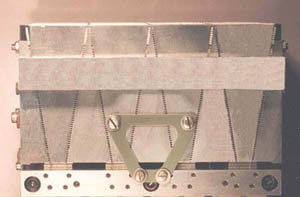 The cold section is machined out of aluminum as a split block, while the warm section (also aluminum) is comprised of four parts with long grooved parts common to four horns. Square feed horns are used, each with a 25 mm aperture. Each horn has one pair of corrugated walls (the other pair smooth), which creates patterns that are symmetric with low side-lobes. The aperture field is. 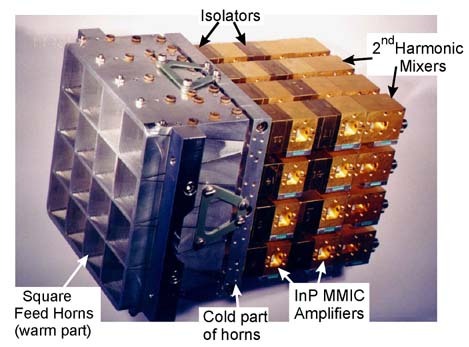 Input amplifiers use InP technology, designed at UMass, fabricated at TRW. Second stage amps made at HRL. Narrow band noise as low as 30 K at 103 GHz. 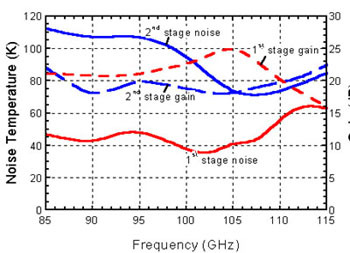 Chips have four gain stages each, 2 MMIC's used for 40 dB gain. Straight through design, 15 mm long, using WR10 waveguide. Input shows return gain at some frequencies when cold. 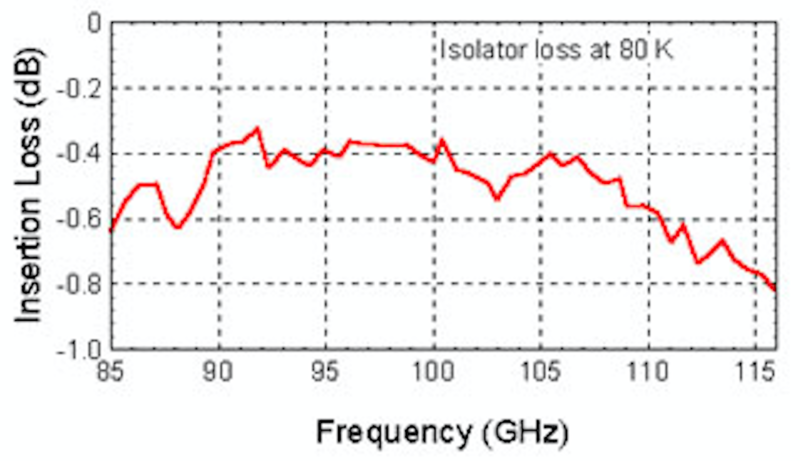 Isolator required at input for good spectral baselines and between MMIC stages for stability and low gain ripple. Very compact isolator using Faraday rotation design. Much shorter ferrite (1.5 mm long), higher magnetic field. Magnetic field is partially shielded to permit close packing. 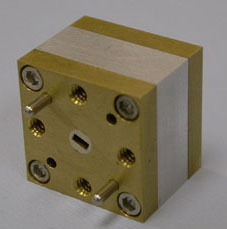 No waveguide twist used, leave waveguides rotated ±22.5°. Isolator operates well at low temperature with no change from room temperature tuning. RT loss is 1.7 times larger than cold. Subharmonic mixer uses beam-lead antiparallel-pair diodes (Cj(0) ≈ 40fF each). 2-20 GHz MMIC amplifier included in block. Mixer and amplifier are operated at 20 K.
Very simple, compact circuit required for 5-20 GHz IF band. LO's at 40 GHz and 60 GHz, power 8mW. 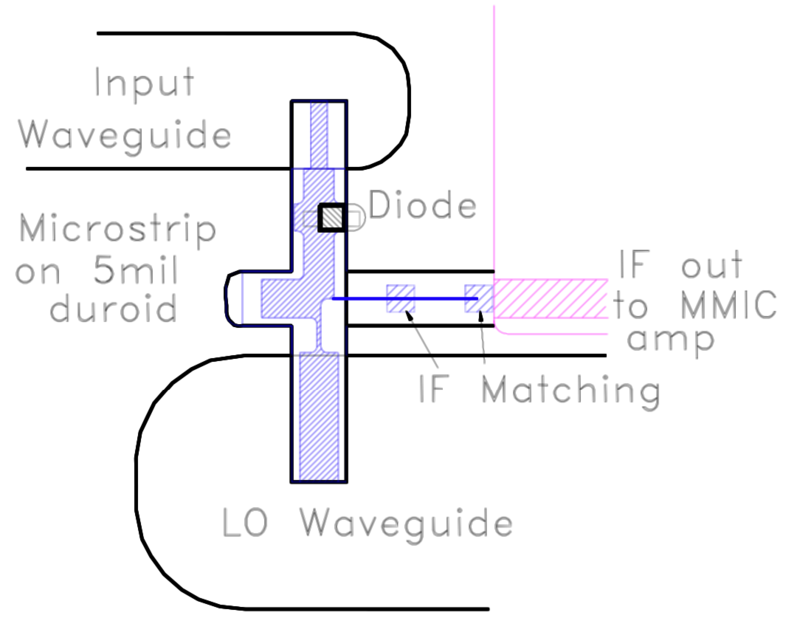 Matching circuit in waveguide. Mixer operates single sideband through 80 GHz high pass filter, and gain roll-off of preamplifiers above 115 GHz. Additional 30 dB gain in 5-20 GHz band inside dewar (at room temp) using cascaded pair of MMIC amps. Second mixer converts to 3.1KHz-100.0 MHz band using synthesized LO for tuning and Doppler tracking. 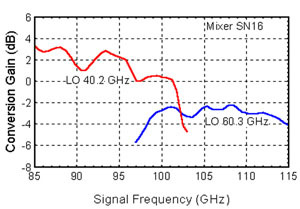 Second mixer is SSB using phasing design, with 20 dB image rejection typically. 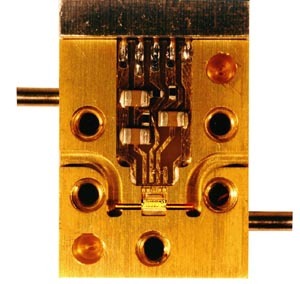 Switchable sidebands required at band edges. Provision for a second IF converter to permit observations at 2 frequencies simultaneously. All possible IF parts are drop-in, MMIC or surface-mount for lowest cost. 8 independent processor modules to handle 16 SEQUOIA-TRAO inputs and 1 LO distribution module. Entire processor has settable digital attenuators. The SEQUOIA array is competitive with wideband SIS receivers, and much simpler to use. 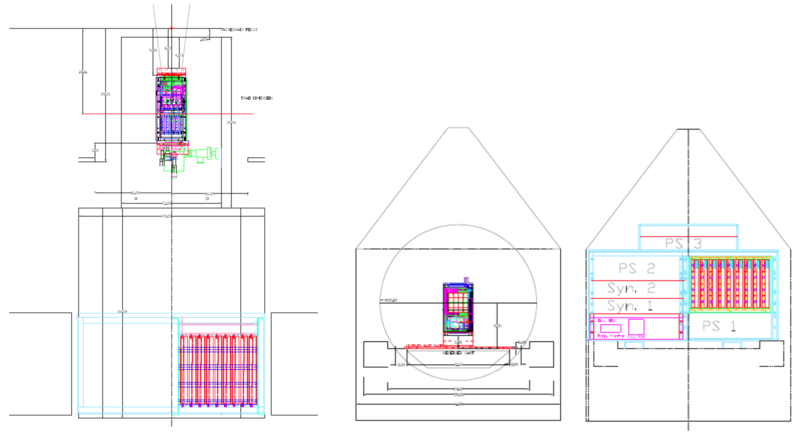 The receiver is cooled by a single 3.5W (at 18 K) refrigerator. 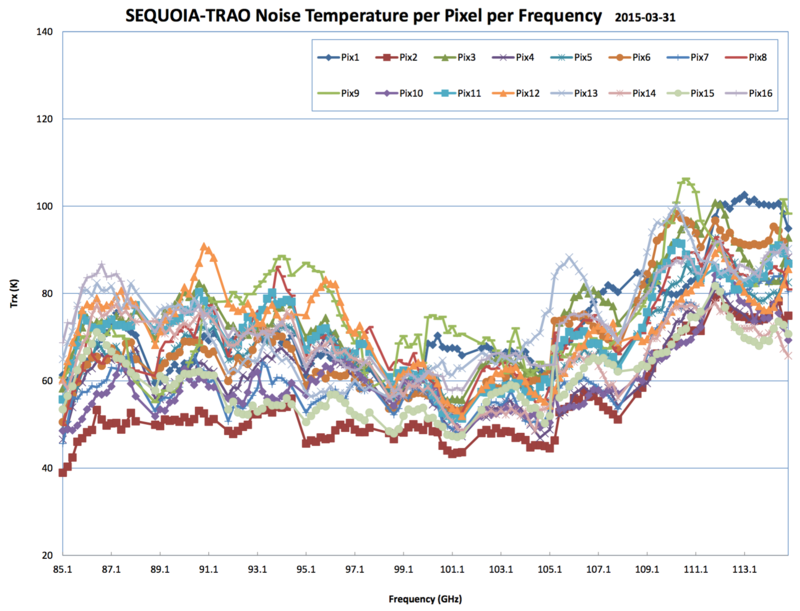 SEQUOIA's spectral line baseline stability is excellent. Gain fluctuations are large (0.2 %) but highly correlated across a wide band.